Neal Oliver: [voiceover] Given an infinite universe and infinite time, all things will happen. That means that every event is inevitable, including those that are impossible. And it's as good an explanation for all of this as anything else. Now, a lot of stories start in bars, so that's where we're going to start this one. Not because I was there - I wasn't. But because it's a damn good introduction to a very unique... fellow. Administered by Universal-MCA Music Publishing, ADO Universal Studios Inc.
Q: Is this movie for real? This is a joke, right? Am I in a coma? I watched this the other night on my Roku box and found myself thoroughly entertained. Sure, it's not perfect. James Marsden, playing the main character, seems to be channeling a young Tom Cruise a lot of the time. And some of the situations or adventures he finds himself in come across as a little forced, as if there's a point to be made and damned if the writer/director, Bob Gale, is going to let anyone stop him from making it. But don't let these things interfere with your viewing enjoyment. The story, the cameos, the subtext and the movie's rhythm work like a charm. Oh, yeah, by the way, charm is the operative word. This movie comes to you with some serious pedigree. Bob Gale, the writer/director, wrote Back to the Future, one of the cleanest, sharpest movies ever made. Whether you like this type of film (mystical, fantasy) or not, you have to agree Back to the Future is flawless from a purely technical, three-act point of view. Interstate 60 has this same kind of flawless energy. So often today movies get re-written and massaged to the point where structure falls by the wayside to make room for more effects and whammies. Other movies seem so formulaic it's as if they were written by a computer. 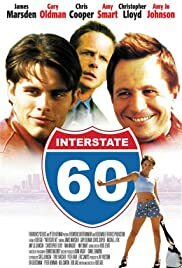 Basically, Interstate 60 is a fantasy road movie. It's Homer on acid. Or Ken Keasey on a magical mystery tour. Actually, it's more like Gulliver's Travels. If you like Gulliver's Travels, you'll like this.